Here we are going to see the formulas and example problems to find the area of the scalene triangle. Now let us see some example problems. Here we can consider the length of each side as a= 12 cm, b = 18 cm and c = 20 cm respectively. The sides of a triangle are 12m, 16 m and 20 m. Find the altitude to the longest side. In order to find the altitude on the longest side of a triangle first we have to find the area of the triangle. 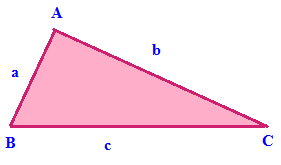 After having gone through the stuff given above, we hope that the students would have understood "Area of scalene triangle"
Apart from the stuff given above, if you want to know more about "Area of scalene triangle", please click here.